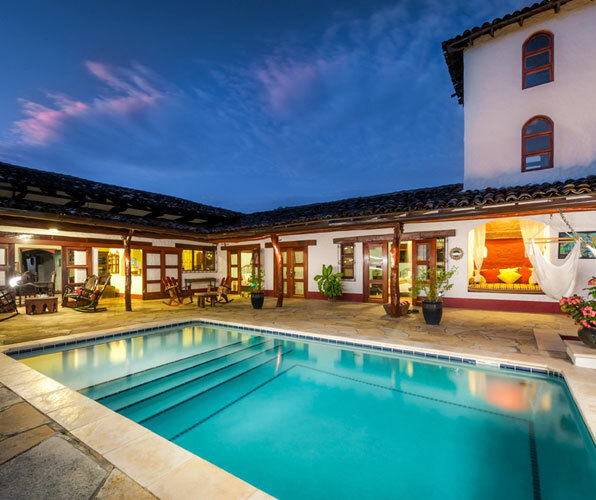 If you and the girls are looking for a once-in-a-lifetime vacation, get ready to saddle up, embrace your inner cowgirl, and head into the sunset at Rancho Chilamate, a boutique eco-guest ranch in San Juan del Sur, Nicaragua. With world-class surfing, pristine beaches, and baby sea turtles only minutes away, getting off the tourist track won’t feel like a chore here, but be warned: being lured away from the turquoise pool, breezy suites with Spanish arches and local art won’t be easy. No cowboys necessary; Rancho Chilamate will sweep you and your girls off your feet! 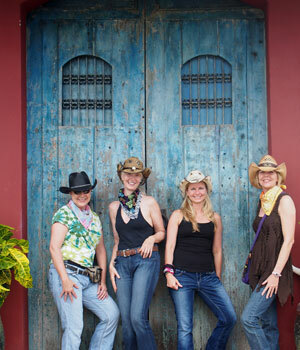 Read on for a perfectly indulgent itinerary with a touch of adventure for your cowgirl getaway. The distant roar of howler monkeys in the morning are the only alarm clock you’ll find at Rancho Chilamate. Whether you decide to hunker back into the most comfortable bed in the country or join a ranch hand gathering eggs for your homemade breakfast is up to you; this is a day for early rising because an entire field of ponies is awaiting. Wash yourself awake in the ensuite bathroom featuring a real wagon-wheel shower head where a cascade of warm water will have you squeaky clean before heading to the breakfast table. Take a moment to marvel at the flavor of fresh-from-the-hen eggs, mop it up with some locally made bread, and toast to the day with a glass of sweet-tart pineapple juice before heading into the “cowboy room.” It’s time to play dress-up! Pick your personality and give her a hat, chaps, scarf, and boots then grab a few props and pose for the camera; Chilamate’s head cowgirl and owner Heather “Blue” van Doorninck doubles as a professional photographer and will load your photoshoot on facebook for plenty of post-getaway giggles. Play speed-dating while the ranch hands match you with your ideal steed, and get a quick lesson if it’s been a while since you’ve been in the saddle. It starts in the jungle where you’ll keep your eyes peeled for howler monkeys and tropical birds but the highlight comes when you’re rounding the top of the hill and get a glimpse of the surf through the trees. Horseback rides depend on the tide here and you’ll be rewarded with the widest, whitest beach in town. Tear down it at a full gallop, hold on to your hat and don’t forget to smile – the photo ops are endless. Racho Chilamate is made for hanging out and soaking it all in, and a trifecta of envy-inducing activities means that you and the girls can do as little or as much as you want in the name of R&R. Vacations are for indulging, so we’ll take you through all three, starting with an on-site massage to work out any tense muscles from a day in the saddle that will leave you smooth as silk and with a silly grin. Don’t worry, you have unlimited access to the reading nooks, white crochet hammocks, and a cooler stocked with wine, beer and fresh fruit juice to recover from the bliss. It’s getting late, so throw a bikini under that cute little sundress for cocktail hour and slip into the pool for a pre-dinner dip to take in the dramatic view of the jungle as nighttime rolls in. It’s almost dinner time so make sure you’ve scheduled a private yoga class for the ladies so you’ll be able to greet the day with sun salutations pool-side. Gather around the “big table” in true ranch style for an unforgettable dinner cooked fresh by your hosts, where you’ll have the chance to swap stories over big bowls of fresh baby greens, succulent steak, and whatever else is on the menu for the night. Vegans and Vegetarians don’t fret – Blue and her crew will make sure to create a menu fit for a queen no matter what your diet needs. You’ll want to spend as much time marveling at the collection of eclectic art surrounding you as you will at the perfectly herbed potatoes or cashew-studded salad. The wine flows freely here and you and the girls will talk into the night. After all, with good company, great conversation, and gourmet food come unforgettable memories. Chelsey is a freelance writer and marketing professional living between Costa Rica and Kentucky, and as many places as possible in between. She’s a well-traveled gal who believes in the power of exploring new places, and has a thing for great chocolate and cheese and adrenaline activities. Make sure to follow along with her adventures on twitter or instagram @ChelseyEnroute! So grateful for the article. Let’s Giddy up!! Volcano Pampering – The Total Spa Experience!